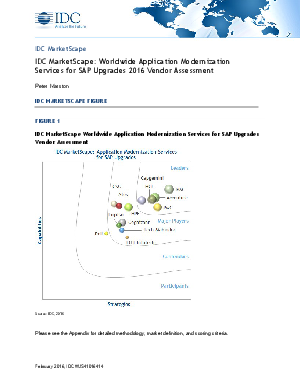 Using the IDC MarketScape model, IDC compared 13 service providers that supply application modernization services, with specific relevance to SAP upgrade services, to enterprises. Need for SAP-related application services remains strong, and packaged application upgrade services are the application modernization capabilities buyer organizations demand most from service providers to aid them in modernizing their SAP applications. Using more than 70 criteria and combining feedback from customer interviews, IDC found that the providers in this evaluation bring diverse capabilities for modernizing SAP applications.